Everyone with a full-time job understands that spending so much time at work can take its toll on your health, especially if you sit at a desk all day. We all need to earn money, but you don't need to settle for letting your health take the backseat to work. There are plenty of lifestyle changes you can make while at work to help boost your health, and therefore improve your productivity and efficiency as well. Stand up to stretch each hour; or better yet, go for a short walk around the building. Desk jobs can be tough on your body. Getting up and moving throughout the day helps ease muscle tension and promote healthy blood flow. Looking to take a bolder step towards healthy productivity? Consider using a standing desk instead of a traditional one. You benefit from more energy and burn calories while still getting your work done. If you use the phone frequently, ensure that you have access to a headset. This keeps your hands free and prevents the need to crane your neck to secure a phone on your shoulder. 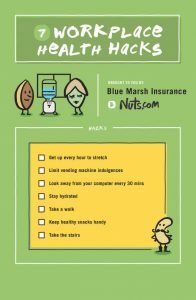 Snacks can help you get through the day, but you should focus on healthy snacks. Rather than relying on the candy bars and chips found in the vending machine, try munching on fruit, veggies, nuts, yogurt, granola bars and other choices that are better for your health. Similar to the point above, you should limit the sugary beverages you consume each week. This includes sodas, teas, juices and energy drinks. It's much better for your health to drink plenty of pure water during the day. Be sure to look away from the monitor for at least a full minute every half hour. This short break helps reduce eye strain. With a few adjustments to your daily routine, you can enhance both your physical and emotional wellness. And with better health, you may spend less time and money visiting doctors. Your health is our priority. Call Blue Marsh Insurance at (877) 627-7480 for more information on Pennsylvania health insurance. What are some of the ways you stay healthy while at work? Let us know in the comments.